So I FINALLY had a chance to make a layout with the Fancy Free line. I've been wanting to fussy cut these flowers so I'm happy Danielle at Paper Issues made the perfect cut file to highlight them. 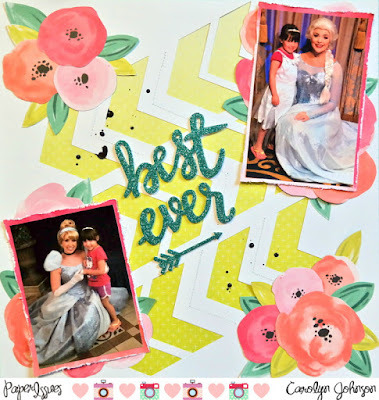 Head on over to the Paper Issues store to download this awesome file and then check out the blog for some inspiration. Everyone used this file in so many different ways. I chose to rotate it and bring the arrows closer together. Here is what the cut file looks like. I cut out the file on white cardstock. Then I put the green paper behind it. I stitched with my sewing machine and built some clusters of flowers. The paper behind the pictures is distressed. Those Thickers! How awesome are they? Finally, I splattered some black paint. Thanks for stopping by! The Paper Issues Store has lots of Fancy Free supplies. Use the code Carolyn at checkout to save 20%.